Officially called Lalitpur Metropolitan City, Patan is one of the three royal cities in the Kathmandu Valley. It has a rich cultural heritage and is known for its fine crafts, evident in the elaborate architecture, stone carvings, and metal statues found all over the city. Patan is actually one of the biggest cities in Nepal, with historic attractions mostly located near Durbar Square and best explored on foot. Patan Durbar Square is a good place to see beautiful examples of palaces, temples, and shrines, and stunning stone carvings of the Sundari Courtyards. The entire city of Patan was designated a UNESCO World Heritage Site in 1979 and is a centre of both Buddhist and Hindu culture in Nepal. Patan is home to more than 1,200 monuments, so tourists are spoiled for choice. One of the most stunning sites is the Krishna Mandir, a stone temple with magnificent friezes built in the 16th century. Other amazing temples include the Mahaboudha Temple, the Rudravarna Mahavihar, the Machchhendranath Temple, the Golden Temple, and the Kumbheshwar Temple. 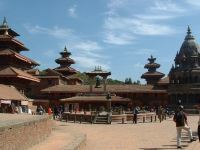 The Patan Museum is also a very popular tourist attraction.